The ever-increasing strain placed on global food resources as a result of agricultural issues, crop failures and the world's rapidly growing population has led to growing opinion that aquaculture may provide the answer to the provision of sustainable food resources on a global scale. The World Aquaculture 2010 Report report by the Food and Agriculture Organization of the United Nations (FAO) illustrated an upward trend in aquaculture, reporting that about 53 million tonnes of global fish production was derived from aquaculture in 2008, compared with 32 million tonnes in 2000. It also reported that 46% of fish consumed globally comes from aquaculture, compared with 34% in 2000. The report stated that aquaculture is "the fastest-growing animal food producing sector." But how can we ensure that the required growth in aquaculture is both economically and environmentally sustainable? Health management is a fundamental goal of any animal production system and aquaculture is no exception. How can production costs be reduced without compromising on feed quality, animal health and overall performance? 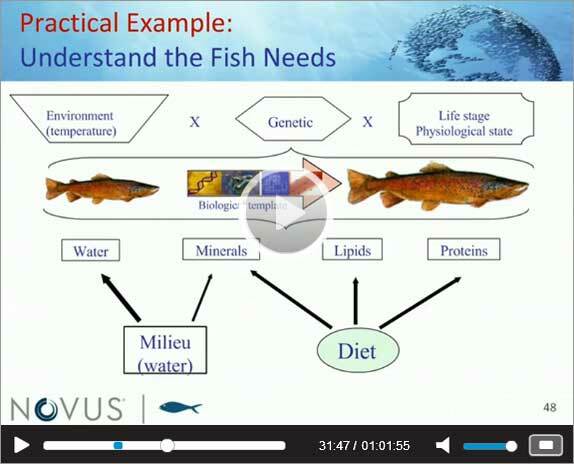 The webinar, featuring four members of the Novus Aquaculture R&D team, was titled "Delivery of practical, holistic aquaculture health and nutrition solutions." It was moderated by Dr. Christiane Barranguet, Executive Publisher of Aquatic Sciences at Elsevier, and illustrated how Novus is developing practical, holistic feed formulations aimed at reducing costs while still maintaining nutritional balance, feed palatability and gut health. A past president of the World Aquaculture Society, Dr. Browdy was a marine scientist for the South Carolina Department of Natural Resources for 19 years. His research over the past 25 years has focused on the application of aquaculture technologies to improve availability of seafood resources. Dr. Ooi Ei Lin obtained her PhD at the Tokyo University of Fisheries, where she studied the antiviral Mx protein in Japanese flounder. 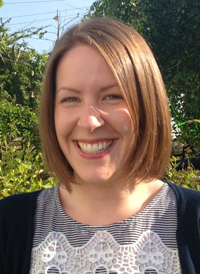 She also has an MSc in aquatic pathobiology and a BSc in marine biology. She completed her post-doc at the University of Tokyo, where she developed a rainbow trout model for the testing of rice-based vaccines and adjuvants. Dr. Dagoberto has a PhD in nutrition and has multifunctional experience in aquatic nutrition and aquatic feed manufacturing (shrimp, marine and fresh water fishes). His career has spanned more than 20 years, of which 16 have been in the international aquaculture nutrition industry. Qingyan Tao, China R&D Manager at Novus InternationalDr. Tao Qingyan has a PhD from Sichuan Agriculture University and has served as an aqua nutrition consultant for feedmills all around China. She is familiar with Chinese aqua ingredients, aqua species and feeding models, and has addressed the challenges encountered by feedmills. How these principles are being applied in China, with practical examples from the world's largest aquaculture industry. The difficulty of balancing the increasing demand for animal protein and economic factors with the creation of sustainable practices that reduce the environmental footprint of a rapidly growing industry. How innovations in feed and nutrition can have a positive impact on feed cost reduction, and the prevention of health problems and diseases that can lead to the loss of stock. Environmental, social and financial sustainability and how the key to sustainable aquaculture is finding solutions that emphasize all of these elements to create a balance that works for everyone. 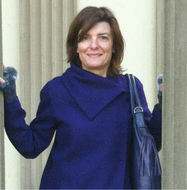 Organized by Elizabeth Ash, Project Coordinator for STM Journals at Elsevier, the webinar attracted 222 registrants. Over 100 took part in the live broadcast, with many submitting questions to the presenters, ranging from queries about the behavior of organic acids on certain bacteria groups to how improved gut health can translate into financial return for producers. Organized by Elsevier and supported by Novus International, Aquaculture 2013 "celebrates 40 years of outstanding science accomplishments in aquaculture" – many of which were published in Elsevier's journal Aquaculture – while also identifying the challenges that remain for the next generation of aquaculture researchers. In addition, the Novus Aquaculture microsite will host an online version of the Aquaculture Conference, which will be available afterwards as a permanent resource to researchers, developers and students in the field, and those who were unable to attend. Learn more on Elsevier's Aquatic Sciences website. 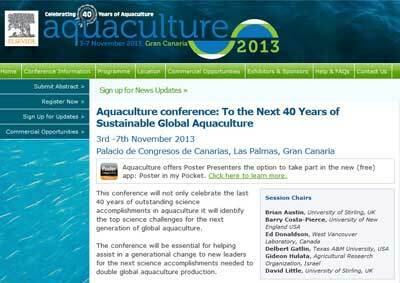 This is a sample of Elsevier articles on aquaculture. All articles are freely available – the first three as open access, the remaining until April 2014.